C.T. Jasper’s Sunset of the Pharaohs brings together both his practice of creative appropriation and a concern with current sociopolitical issues. This large video installation consists of a dynamic structure that extends like an accordion upward and outward from the plane of the screen onto which his video is projected. 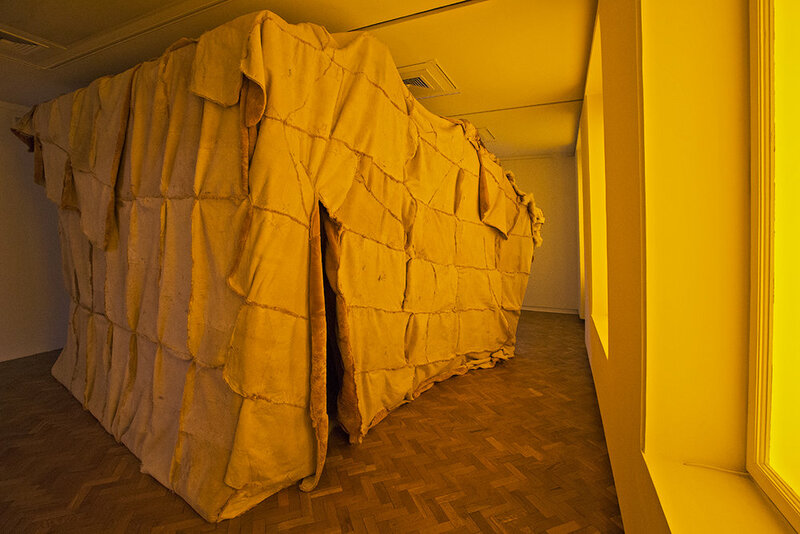 The wooden structure is draped in tanned sheep skins and is reminiscent of a photographic camera’s bellows – an instrument used to correct for the distortion created by the curvature of the lens, especially in architectural photography. This photographic reference and the structure’s relationship to the space of the cinema or film theater—a space of both real and psychological projections—brings to focus in Jasper’s installation that objectivity is a key element of disputation. Jasper’s choice of starting point is a popular Polish film of the 1960s: Jerzy Kawalerowicz’s 1966 film Pharaoh. Kawalerowicz’s film delves deep into layers of allegory and veiled political commentary on the mechanisms of state power. The storyline of Kawalerowicz’s film is adapted from a late 19th Century novel by Bolesław Prus that outlines the fall of Egypt’s New Kingdom under Ramses XI (referred to inaccurately in Kawalerowicz’s film as Ramses XIII), and this book was itself a vessel for numerous political and historical commentaries since it was written. It does not come as a surprise then that Kawalerowicz’s film becomes, in essence, a veil for his own thinking about specific, contemporaneous political and social realities under socialist rule in Poland. Ideas of hubris, power and the abuses of power are all exposed under the cover of Ramses XI’s historical narrative and his bureaucratic-aristocratic regime. Using a method of digital erasure, an incredibly meticulous and painstaking process through which the human figure is removed from Kawalerowicz’s film, Jasper breathes new life into his version of Pharaoh and adds yet another layer of complexity to its history of veiled political commentary. Within the deserted and emptied out space of the original feature film, only minimal background sounds remain. This emptied and silenced film is then punctuated intermittently by brief interludes wherein field recordings and recitations of contemporary Egyptian poetry ring out in the empty pavilion, including urgent words voiced by the civil demonstrators and poets Mahmoud Darwish, Amal Donkol, Ahmed Fouad Negm, Nasser Farghaly, and Abul-Qasim al Shabi. Jasper’s hollowed out Pharaoh empties the original film of its specific political impetus and thus allows for an alternate contemporary voice to accompany it, the voice of activism and resistance relevant to the entire world. Jasper’s silenced Pharaoh and its references to Egyptian poetry in the context of the Arab Spring and its inconclusive aftermath make the film’s structure and narrative become particularly topical. Even as the far-reaching sociopolitical effects have been felt across the globe, the process of revolution in the Middle East is ongoing. Jasper’s Sunset of the Pharaohs provides, then, a timely, critical context for the processes of reading, writing and rewriting history in a mediated culture. The installation creates an impossible new place of desire, violence, hope, and speculation. 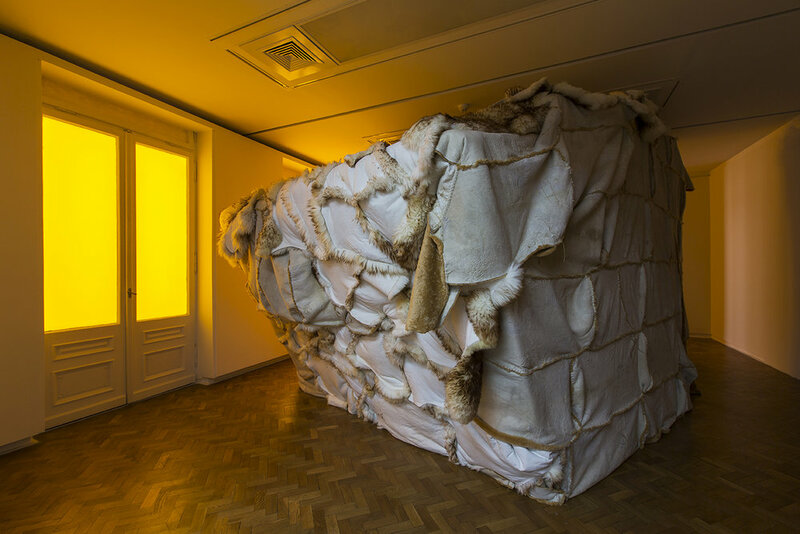 Not a place of resolve, the hybrid openness of this installation challenges viewers to simultaneously experience a place of escape and political confrontation, erasure and poetry, meditation and urgency.